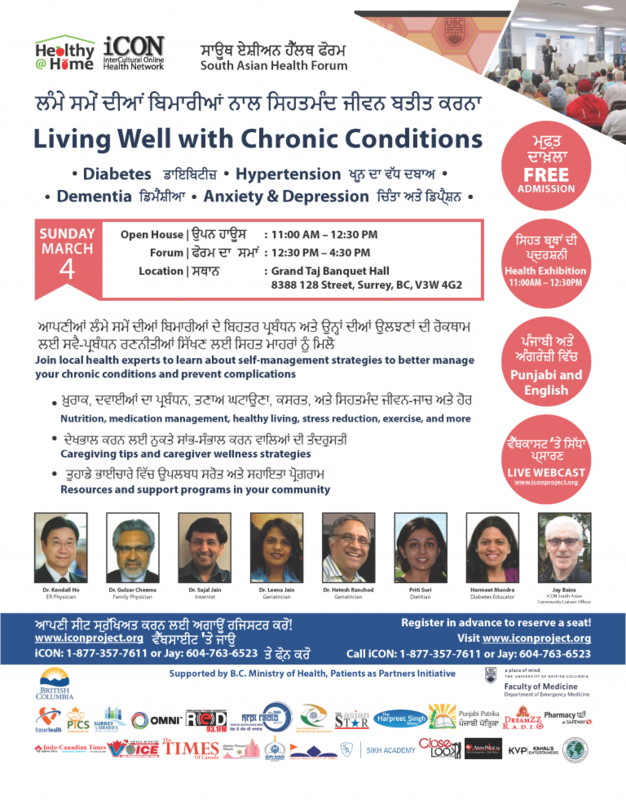 On March 4, 2018, iCON (the interCultural Online Health Network) will host a free South Asian Health forum entitled Healthy @ Home: Living Well with Chronic Conditions. This forum will expand on the theme of healthy aging to promote chronic disease management, healthy living, and community support services. As the population ages, South Asians are at greater risk for developing chronic conditions such as diabetes and high blood pressure, making them vulnerable to developing dementia, as well as other mental health issues in their senior years. Studies in Canada have shown that South Asians have higher rates of being diagnosed with diabetes and hypertension due to genetics and lifestyle factors. Living with these illnesses can be debilitating and significantly impact quality of life. However, by developing good habits, these conditions can be well-managed and good health can be achieved. This free South Asian health forum will be delivered in Punjabi with simultaneous interpretation in English. Health experts from the community will educate on diabetes, hypertension, dementia, and mental wellness including anxiety and depression. The forum will highlight strategies and best practices for managing these chronic conditions at home through nutrition, medication management, stress reduction, exercise, and more. In addition, the forum will feature the opportunity to ask questions to the experts, health exhibitions, resources and community support programs. Who: Seniors and their families, caregivers – everyone is welcome! ਕੌਣ: ਬੁਜ਼ੁਰਗ ਅਤੇ ਉਨ੍ਹਾਂ ਦੇ ਪਰਿਵਾਰ ਜਾਂ ਸੰਭਾਲ ਕਰਤਾ – ਹਰ ਕਿਸੇ ਦਾ ਸੁਆਗਤ ਹੈ!